If you’re concerned about Who Owns Organic Food Companies in 2014 (hint, it’s big food – not small-scale farmers), now there’s something you can do to help solve this problem. Cornucopia has just released a petition that focuses on one of the big bads in organic takeover: Dean Foods. Basically, after years of already doing much harm to the organic dairy industry, Dean Foods has now spun-off their branded products division (WhiteWave), including the Horizon and Silk labels, thus further cheapening organics and its brands. Because WhiteWave is a corporate representative teaching a ‘workshop’ this Saturday at the MOSES Conference, Cornucopia is seeking to let MOSES know about how they feel. Cornucopia notes, “How will this WhiteWave executive help us better understand today’s organic consumer? Will she encourage us to cheapen production costs by sourcing feed and ingredients from China or factory farms? Will she instruct us on how to break contracts with family farmers? Or market new non-organic products with the same name and nearly identical packaging that’s already familiar to organic consumers?” Yes sir to all of the above most likely! You can help put a stop to corporate takeover of organics by signing the petition asking the MOSES board of directors to cancel WhiteWave’s workshop. MOSES is a great organic tradition in the real organic industry, so why let it be polluted by big food? + SIGN the petition NOW! If you're concerned about Who Owns Organic Food Companies in 2014 (hint, it's big food - not small-scale farmers), now there's something you can do to help solve this problem. Cornucopia has just released a petition that focuses on one of the big bads in organic takeover: Dean Foods. 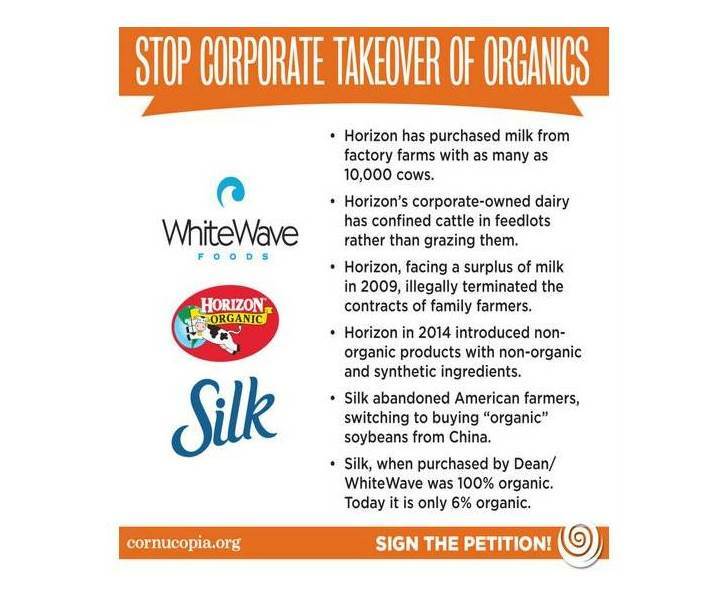 Basically, after years of already doing much harm to the organic dairy industry, Dean Foods has now spun-off their branded products division (WhiteWave),�including the Horizon and Silk labels, thus further cheapening organics and its brands. Because WhiteWave is a corporate representative teaching a 'workshop'�this Saturday at the MOSES Conference, Cornucopia is seeking to let MOSES know about how they feel. Cornucopia notes, "How will this WhiteWave executive help us better understand today's organic consumer? Will she encourage us to cheapen production costs by sourcing feed and ingredients from China or factory farms? Will she instruct us on how to break contracts with family farmers? Or market new non-organic products with the same name and nearly identical packaging that's already familiar to organic consumers?" Yes sir to all of the above most likely! You can help put a stop to corporate takeover of organics by signing the petition asking the MOSES board of directors to cancel WhiteWave's workshop. MOSES is a great organic tradition in the real organic industry, so why let it be polluted by big food?